Dubbed the “Gastronomic Glastonbury”, Bristol Foodies Festival is the UK's largest celebration of food and drink. This year, visitors can expect a new and exciting Healthy Living focus, with stalls and demonstrations themed around topics such as ‘Grow Your Own’, and Gluten Free Cooking. There will also be a Dessert & Cake Theatre for guests with a sweet tooth, and a Kids' Cookery Theatre for budding little chefs. Now in its 20th year, the Dart Music Festival will play host to a number of fabulous acts spanning almost every musical genre. Expect an eclectic mix of orchestral, rock, choral, blues, opera, folk, and jazz performances at a variety of indoor and outdoor venues including hotels, pubs, restaurants – and even two churches – throughout the weekend. This popular event is free to attend and is set against the marvellous backdrop of the River Dart. Taste, try and buy the finest flavours and tastes that Cornwall has to offer at this two day event. Some of the best chefs in the county will be on hand to give cooking demonstrations and visitors can peruse stalls filled with food and drink from fantastic producers from across the UK. The event blends cooking and baking, so whether you’re more at home with a saucepan or a cake tin, you’ll no doubt come away with plenty of tips and tricks to improve your cookery thanks to the many expert demonstrations on offer. Watergate Bay’s award-winning Aspall Polo on the Beach is back in 2017 for its tenth year. The action packed spectacle attracts thousands of people every year and showcases world-class polo, equestrian displays, and family entertainment against the fabulous backdrop of Watergate Bay. In addition to the polo matches, visitors can also look forward to various forms of arena entertainment, such as horse jousting and stunt displays, polo demonstrations, and even Segway polo! Beach entertainment will include family activities, Segway taster sessions and delicious food and drink stalls. Events Square will once again host a variety of pop up stalls from some of Cornwall’s finest street food producers. The event brings together flavours from around the world as well as craft ales from the numerous Cornish micro breweries like Padstow Brewing Company and Keltek Cornish Brewery. Look forward to live performances right through the weekend and undercover seating, so you can eat, drink, shop and dance all weekend long – regardless of the weather! Set against the idyllic backdrop of River Cottage HQ, the Spring Fair promises to be a wonderful occasion for the entire family. Not only do children under 16 come for free, but the event will be brimming with activities, including chef demonstrations, artisan food stalls, live music and garden and foraging tours from River Cottage’s very own foraging guru John Wright. This exciting weekend event will see Plymouth Piazza transformed into a lively festival, brimming with local delicacies and live music. You’ll find more than 100 traders showcasing the very best regional produce, and live cookery demonstrations from talented celebrity chefs such the Tanner Brothers and Mitch Tonks. The Fun Kitchen will also return to Sundial Square this year, hosting three days of hourly workshops to keep children entertained throughout the event. Without a doubt Bath Boules is one of the highlights of this historic city’s calendar. Combining the most English of occasions with a quintessentially French game, participants and onlookers are guaranteed to have a terrific time. There will be a cafe and bar on site as well as plenty of street food, an evening party, and ample entertainment for the kids. Bath Boules is a real mini festival in the heart of the city and, best of all, proceeds from the event will go toward local charities. Christmas is truly the most wonderful time of the year, and there are few better places to celebrate this magical time of year than here in the South West. Longleat park has been transformed into a glowing winter wonderland to mark the Safari Park’s 50th Anniversary the park. This year it will play host to Europe’s largest Chinese Lantern Festival in a celebration of all creatures great and small, alongside the help of a host of Beatrix Potter characters. Join Peter Rabbit and his friends among famous scenes from the books and watch as the historic location lights up the night sky. Rekindle the childhood magic of Christmas by attending this beautiful candlelit procession in the South Devon town of Dartmouth. 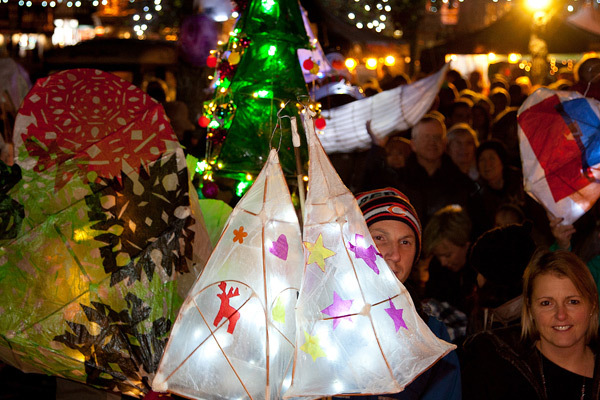 Set alongside the river Dart, the Elizabethan streets of Dartmouth will come alive with the glow of Christmas lanterns generating a marvellous seasonal atmosphere that attracts revelers from all across the country. There will be street stalls selling a range of locally made fare, plenty of carol singing, and traditional hot chestnuts roasting over open fires. To find a truly unique gift this season pay a visit to the Devon Guild of Craftsmen’s annual Christmas selling exhibition 'MAKE'. The event showcases over 50 designer-makers from across the UK and contains works in a variety of disciplines at a range of prices to suit everyone. For the past four years The Abbey Hotel’s Après Ski Bar has become a much loved part of the Bath Christmas scene, bringing a much needed dash of alpine ambience to the city centre. The venue acts as the perfect spot to put your feet up and enjoy a glass of something festive and also doubles up as a magical winter wonderland for children. Illuminated walks don’t get much prettier than the Enchanted Christmas trail at Westonbirt. The magically lit-up trail is 1-mile-long and perfect for the whole family. Along the way you will find plenty of interactive features to get involved in and afterward you can look forward to warming up with mulled wine and hot chocolate while listening to Christmas carols. The trail is open every Friday, Saturday and Sunday evening from 25 November to 18 December. This year the Architecture Centre will once again collaborate with Made in Bristol by transforming its gallery space into a seasonal shopping hub. Head along to this exciting pop-up for tips on sustainable ways to shop and to meet local makers. You can learn first-hand about their creative process, discover the latest trends and support the South West’s thriving creative economy. Christmas is a magical time at the Eden Project. From twilight, the whole site will light up with thousands of glistening lights and children can look forward to a visit from Father Christmas and his elves. Skate on the specially-built ice rink or head over to the Eden Project café for some hearty seasonal food. Get out into the countryside and into the festive spirit at Hartley Farm this month. Enjoy a glass of mulled wine and food from over 15 of the region’s best local producers as well as live music courtesy of S4xophony and Courgae Choir. There will be a bar full of festive, warming drinks and a fantastic line up of cooking demos, including Henry Herbert (of the Fabulous Baker Boys) and Hartley’s very own Head Chef & Head Butcher. The Made in Bristol Gift Fair takes place in the majestic foyer of Colston Hall and offers visitors the chance to browse more than 200 stalls of hand-crafted products and artwork. The event is ideal for those looking to source unique and original Christmas gifts this year, with each show offering a unique selection of the region’s most skilled designer-makers, from weavers to carpenters; ceramicists to print makers. Entry to the event is free and it will take place throughout four separate days during November and December. This year Bowood House – the family home of the Marchioness of Lansdown – is getting a spectacular Christmas makeover and visitors are invited along to indulge in a touch of festive shopping. Peruse a variety of stunning stalls filled with handmade toys, food, clothes, books, silk flowers, handbags and table decorations, plus a choir singing in the chapel. A Christmas café serving hot drinks and festive favourites will be open throughout the day.